It really is a flaming treat to be celebrating my 20th anniversary at the Loaf this way: sharing my memories of covering Charlotte's theater scene since 1987 and interviewing two-time Tony Award-winning actress Cherry Jones. All of us can share this treat. We rarely get to behold a Pulitzer Prize Drama among the splashy spectacles packaged in the PAC's Broadway Lights Series. 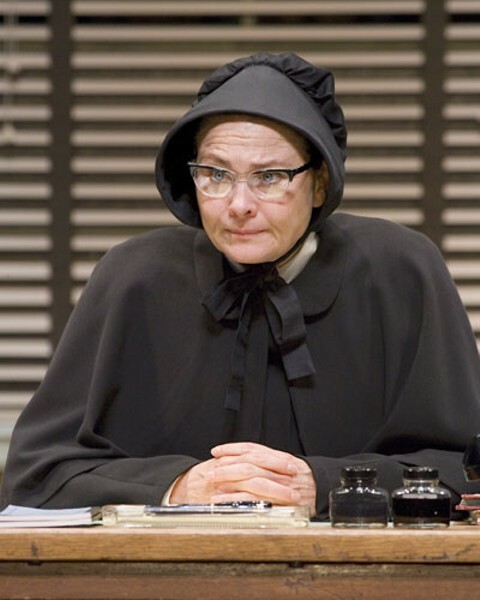 To also see the original above-the-title Broadway star of Doubt is unprecedented during the Loaf era. John Patrick Shanley's gem, arriving at Belk Theater for an eight-performance run on April 17-22, couldn't be timelier. At a time when we're facing the multiple messes of a cocksure presidency, Shanley is asking us to question the whole notion that certitude is the mark of strength -- and doubt a mark of weakness. And at a time when we have ample reason to mistrust priests, Shanley is asking us if we have the wisdom and strength to suspend judgment. Whether you see this struggle in a school context or in a political context -- invade now, check intelligence later; incarcerate now, delay trial indefinitely -- Doubt is very much Remedial American Idealism 101. Portraying Sister Aloysius at a Bronx Catholic school in 1964, Cherry is pitted against the charismatic Father Flynn, who may or may not be carrying his chumminess with students beyond the bounds of decency. From Flynn's perspective, however, it's more like a pit bull grabbing hold of his priestly robes. Having seen the original off-Broadway production, I can tell you that Doubt is the real deal if you're looking for gripping, provocative theater. Likewise, Jones' reputation for high-grade collegiality and meticulous preparation were quickly confirmed when I called her cell phone at the appointed time two weeks ago. If you read our 30-minute conversation in its edited entirety, you'll find that this Parisian savior faire is anything but accidental. The reigning First Lady of the American Stage -- a native of Paris, Tennessee -- not only sees herself as following in a grand tradition, she takes special pleasure in the theater life. Among her colleagues. Regal? I caught up with her at a picnic table under pine trees in Hershey, Penn. Creative Loafing: First let me thank you personally for extending your touring commitment to Doubt. Cherry Jones: Oh, I am so glad it worked out. Because I started this one, and I want to be able to put this one to bed. You turned me from a liar into a prophet. I hadn't realized that you weren't committed to the whole tour when I looked at the web site early in the season. So I'm assuming that you had some misgivings about transferring Doubt from Broadway to some of the big auditoriums around the country? Having gone from a 300-seat house to a 1,000-seat house at the Walter Kerr, I knew how the size only, in a way, helped the play. Because at times, it's almost Greek in its passion. And I knew that if I were ever going to tour in any play, this would be the play to tour with. Yes, all touring houses are now too large for legitimate plays. But this play -- if you can hear this play, you get this play. This isn't a play that relies on your being able to see the teardrops falling from our eyes. This is about ideas, and it's passionate. It's as Oscar Wilde says, at one point in The Importance of Being Earnest, "We're going to hear a play tonight." I saw it at the Manhattan Theatre Club, and I felt very fortunate to be sitting so close. And I had a certain amount of misgivings about how it would do on Broadway, but it received a thunderous reception. Yeah. I think the larger house did it a world of good. Instead of playing it in a tiny little chapel, suddenly we were in a cathedral, you know? Now on these tours, we're doing it in a basilica, I guess. Now I have actually seen you in Doubt, Imaginary Friends and The Heiress -- and I think you had already taken over in Angels in America when I saw both parts of that. I must say that your performance as Sister Aloysius was head and shoulders above everything else. Do you take a special satisfaction in introducing such a major character to the stage? Oh, sure. It's just Heaven getting to start fresh with a character with no ghosts hanging around and no one's expectations judging how the play should be played. It's wonderful, and Doug Hughes, our remarkable director, was so wise in his direction of this play. That's another reason why I wanted to get to do the tour. This is just one of the best productions that this play will ever receive.